MAM members may log in (blue button at top of website) to activate this registration option. Includes lunch. Register BEFORE September 11 and save! Register BEFORE September 11 and save! Non-member price includes lunch and a $25 credit toward MAM membership. MAM members may log in (blue button at top of website) to activate this registration option. Includes lunch at the dining hall. Includes lunch and a $25 credit toward MAM membership! Includes lunch. Valid student ID required at registration. Members may log in (blue button at the top of the page) to enable the member rate. Please email cancellations to info@mainemuseums.org before September 30, 2018 to secure a full refund. Cancellations emailed to info@mainemuseums.org between September 30 and October 7, 2018 will receive a refund, less a $25 administrative fee. Refunds will not be offered for cancellations received on October 8, 2018 or later. Presented by Northern Artery, the 2018 conference will offer a mixture of sessions, workshops, networking opportunities, and a dynamic keynote address that will leave you feeling recharged, connected, and inspired with new ideas to assist you in the care and management of your collecting institution. As volunteers and professionals in Maine's community of collecting institutions, many of us are accustomed to looking into the past. At this year's conference, we invite ourselves to look into the future by honing our skills in organizational visioning, strategic planning, and succession planning, as well as various other topics such as educational and event programming, advocacy, diversity and inclusion, preservation and collections care, fundraising, and governance. Colin Woodard will be giving the keynote address titled Deeper Context Downeast: How Maine's Past Informs the Present and Shapes the Future. Woodard is an award-winning author and journalist. He is State and National Affairs Writer for the Portland Press Herald / Maine Sunday Telegram, where he was a 2016 Pulitzer Prize finalist and received a 2012 George Polk Award for his investigative reporting. A native of Maine, Woodard is the author of American Nations: A History of Eleven Rival Regional Cultures of North America, which won the 2012 Maine Literary Award for Non-Fiction. His other books include the New England bestseller The Lobster Coast: Rebels, Rusticators, and the Struggle for a Forgotten Frontier; the New York Times Times Bestseller The Republic of Pirates: Being the True Story And Surprising Story of the Caribbean Pirates and the Man Who Brought Them Down; and American Character: A History of the Epic Struggle Between Individual Liberty and the Common Good, which won the 2017 Maine Literary Award for Non-fiction. See the program to get an idea of what to expect. The final version will be available at the conference. Lots of other great discussion topics and networking opportunities! After the conference, many of the session leaders sent us links and presentations that they would like shared with attendees. See the list below! Lunch will be held in the dining hall with a multiple options. Please tell us when registering if you have any dietary restrictions so we can make sure you are accommodated. The annual meeting of MAM's membership also takes place at the conference each year--this is your chance as a MAM member to vote on new officers or changes in policy, or to address issues that affect the organization and its membership. 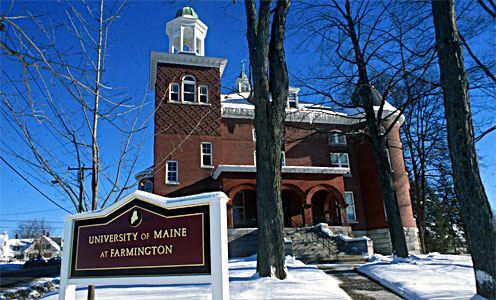 The conference will be held at the at University of Maine Farmington at 224 Main Street in downtown Farmington - near Routes 2, 4, and 27. Directions: Use the directions listed on the UMF website. Parking: On the campus map, parking is available at lots P11, P15, P26, and the Old South Congregational Church. Street parking is also available. No parking passes are needed in these areas. The P15 lot is best for those with wheelchair accessibility needs. Map: See the campus map on the UMF website. Registration, exhibitors, sessions, lunch, and snacks will all be in the Olsen Student Center. The keynote address and annual meeting will be in the Roberts Learning Center. Bathrooms: There are gender-neutral bathrooms, as well as those labeled for men and women. The gender neutral bathrooms are on the main floor in the Olsen Student Center on the South Street side of the building. Accessibility: All spaces used for this event are accessible to standards set in the Americans with Disabilities Act (ADA). Online registration for MAM Members and non-members opens on August 4, 2018. Early bird registration rates are available through September 10, 2018. The last day to register will be September 30, 2018. To register after September 30, please bring payment to the conference ($75 members; $100 non-members). We will be able to accept checks or credit/debit cards at the conference. Please get in touch about sponsor opportunities. Sponsoring and exhibiting at the Maine Archives & Museums Annual Conference are great ways to reach museum and archives professionals throughout Maine. See here the opportunities available for sponsors and exhibitors.